I came across this book today while doing an online search for the Grosse Pointe Yacht Club (more about that later). I smiled when I read the blurb (especially the fantastic opening line above) which tells about a young girl who moves to (surprise) Grosse Pointe at the age of 13, and her social struggles and triumphs throughout her high-school years. 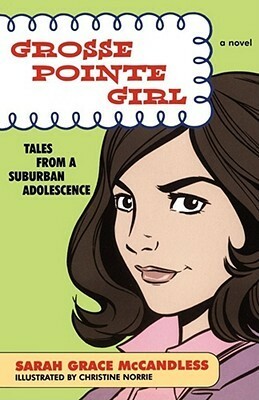 Set in the 1980s, the book promises cultural references and teen dialogue that will appeal to any reader (can’t figure out who the book is geared towards – tween or young adult). It was published in 2004 and written by a (surprise) former Grosse Pointe resident. Amazon reviews give it high praises, but reviewers on more bookish sites like Goodreads say that at best, it was an easy read, at worst, it didn’t have any plot or character development. Ouch. Though it may not be the best read, I don’t doubt it’s a fun one. If I ever get my hands on a copy, I’ll let you know if I’m right. This entry was posted in Grosse Pointe, Other and tagged Book, Books, Grosse Pointe, High School, Novel, Tween, Young Adult. Bookmark the permalink. I feel the same way whenever I walk off a plane in Hawaii. It’s very thick. But at least there, there are breezes all the time. I am, actually. Sometimes it’s a bit much, but…I grew up in Hawaii so at least it’s not completely foreign. And we just (finally) bought an air conditioning unit for the rental so everyone is much happier. We were dying. Hey that’s good that you can tolerate that humidity! My wife landed in Columbus, Ohio last night to see her niece while she goes through a week long Fencing tournament. When she got off the plane, that humidity sort of slapped her. She said it was like walking through water. Since we are totally acclimated to the extreme heat and extreme low humidity of Las Vegas, it is tough on her. Three cheers for your new A/C!! !